The videos are mp4. They play fine on the phone but when I transfer them to my computer (via usb or BT) the video doesn't play. I get the audio but no video. I've tried Quicktime, Windows Media Player and even Windows Movie Maker. WMP and WMM don't tell me they can't open or play the file format. They do the same thing as QT and I KNOW QT plays mp4 videos. The last second of the black video screen, the screen turns green and a bit of pixeled video shows up on the left edge. What am I doing wrong? Try VLC media player. It normally plays absolutely everything. drinkoldcoke and mru007 like this. I've had that before. I'll reinstall it BUT why wouldn't Quicktime play it's own format? You should uninstall QuickTime as soon as possible. I use QT to render mvi videos from my Canon camera using H.264 compression. I could also easily trim videos. I'm SURE this is old technology today but it has given me the best quality video at a reasonable file size. What are some good (preferably free) alternatives? I have VLC 2.1.3. I remember the videos being super saturated and altho it would play any format, I don't think I could render them. It's not currently installed. OK, I'm going to uninstall QT 7 Pro. Is it enough to remove it via the Control Panel or do I need to hand clean the registry of any remaining files? Downloaded the latest version of VLC and it won't play my phone's mp4 videos. What's everyone else using? I DO get a picture but it's static...no video. And I get the audio. OK, I've uncovered the problem but I don't know WHY it's a problem. I shot a video using UHD, QHD and FHD. 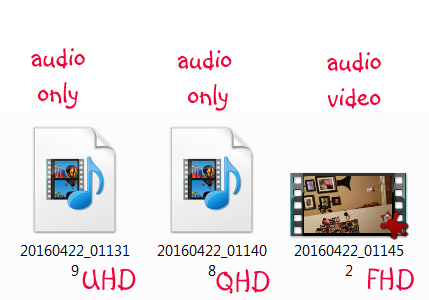 UHD and QHD do not present themselves as a video...audio only. FHD plays back on my computer as it should. Can someone please let me know if they're able to get video playback on your computer using UHD and QHD settings? What kind of computer are you using to view the files? I am partially wondering if your video adapter in the computer is unable to work with resolutions over 1080p. Oh I'm going to be so MAD if that's the case! I have a Dell XPS 8300. When I bought it thru Dell in late 2011, I upgraded the video card to an AMD Radeon 6870. It died a couple months ago (first time I've ever had a component in a Dell go bad). The computer guy told me I didn't need such a big vid card (I'm not a gamer) and talked me into buying a NVIDIA GeForce GT 740 2GB Superclocked. I don't remember if it's DDR3 or 5. Should this card be able to play those files? He knew I did photography and video editing. Samsung always does some proprietary crap with video sharing and playback, it's probably something non standard on their end. Let me look at the technical mumbo jumbo as far as codecs and post back here if I get an idea. You should be able to play those files IMO. I'd be glad to test it on my system and take a look at the video file if you'd care to either post a short clip or email me one. I will MSG you with my email if you are interested or PM me ? I have a 3770k system with a GTX 780ti so I should be able to test anything that will play them as far as I know. The desktop one doesn't list codecs support, but i'd guess it is at LEAST as good if not better. quick mediainfo of a 4k video with default camera app. probably not. drinkoldcoke, can YOU play QHD and UHD vids on your computer? If you (or anyone else) hasn't tried, would you mind checking to see if they play on your computer? My S5 recorded video in 4K and my computer had no problem playing it. This isn't good. I make video slideshows of the grandbabies using Proshow Producer and expected to be able to record some really good videos with the phone. You can at least make FHD videos until you figure it out. Most people don't have 4K monitors or TV sets anyhow. I know that's not ideal however. I don't know why or what changed but after spending about 20 minutes with a Verizon ts rep who had no clue what QHD and UHD were and in all honesty wasn't supposed to be troubleshooting the fact that these resolutions wouldn't play on my computer, IT'S FINALLY WORKING It was nothing he told me to do (because he didn't tell me to do anything). I just graciously put this conversation out of his misery since we were getting nowhere and tried again. They're playing on VLC. I tried that earlier (latest version) and it didn't work. He did tell me that 4K wouldn't work on my monitor if it wasn't supported. I asked him if he meant to say I wouldn't get the full resolution. He said no, it won't play at all...well as you know, it does. I transferred some concert video from my Galaxy S7 phone to my Dell pc and they won't play. It is a Dimension E310 that is about 10 years old. The sound comes through pretty good but the video is all distorted. Someone had posted a while ago that VLC works. I have installed it but still can't figure out how to get the videos to play right. I had previously transferred video from my little Canon PowerShot camera. Those videos are .avi and they play fine through QuickTime. Any ideas? In layman's terms? Thank you. I assume you are using Windows XP because the Dimension E310 came with it. Windows XP comes with Windows Media Player. It does not support the MP4 video format. However, MPC-HC does support the MP4 video format. I just tried MPC-HC on a Windows XP computer. It played a MP4 video from my S7. How did you make it work? I've tried VLC but still no video. Just audio. I've tried so many players. The MP4 video might be corrupted or encoded with a video codec that's not recognized by the media player on your computer. my message attachment icon(paperclip) is missing on my asus zenfone 2, update. do get back?